This was my second time to Europe, the first time to Europe was exploring places in western part of Europe. We transit in Istanbul and our first stop is Berlin, the largest city of Germany. Once we arrived in Berlin early in the morning, we went to the city center. 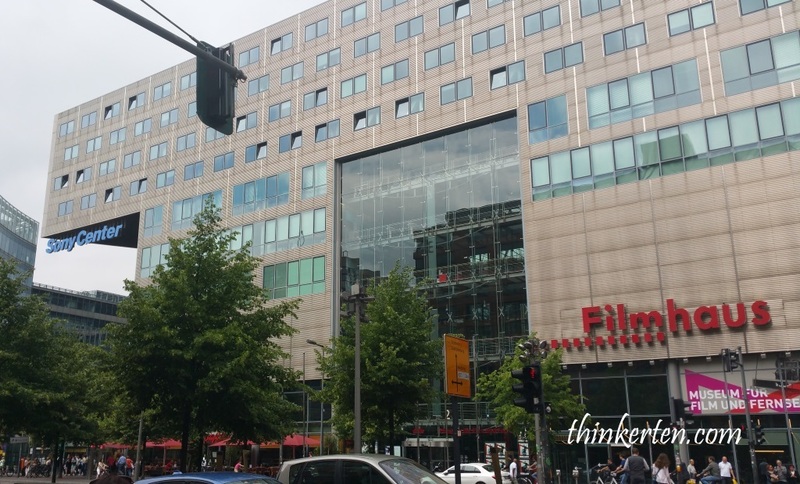 We were at the busy city, Potsdamer Platz in Berlin. 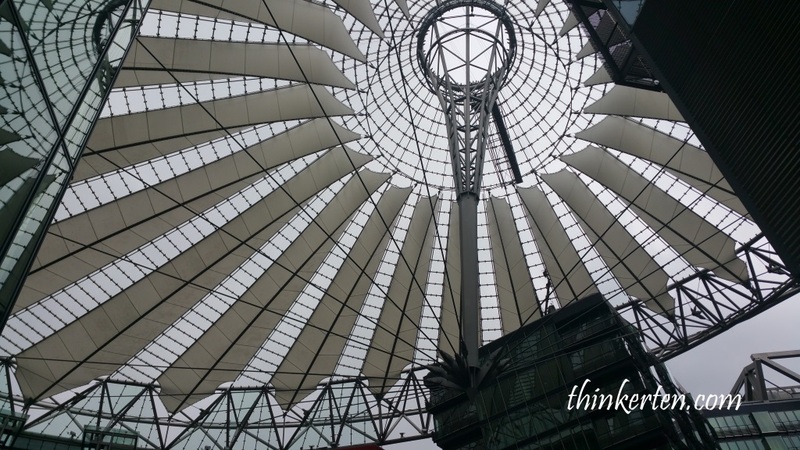 This place is a famous modern architectural landmark – Berlin’s Sony Center. The roof top was really beautiful and it is even more amazing during night time when there is light up. The Sony Center contains a mix of shops, restaurants, hotel rooms, office, art and film museums, cinema and a Legoland Discovery Center. 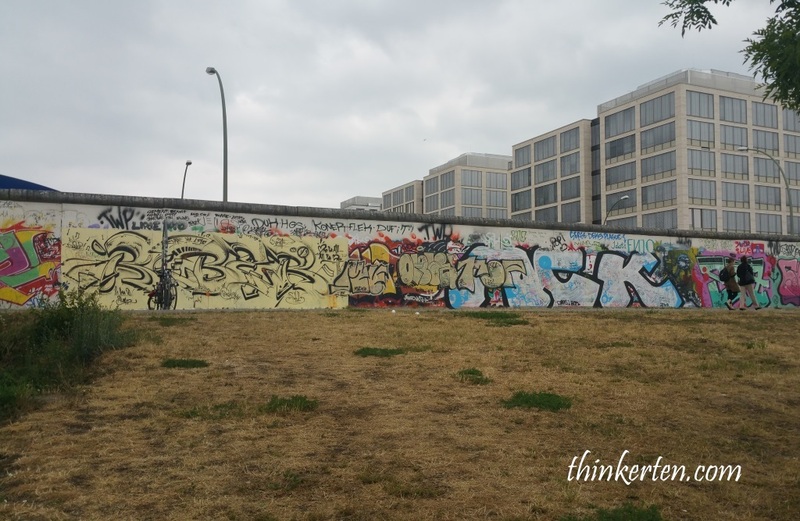 Everyone knows about the Berlin Wall was a barrier that divided Berlin from 1961 to 1989. The building of the Berlin Wall had divided families and neighborhood in the capital of Germany. The word “freedom” can be seen drawn in the Berlin wall. The Wall now carries messages of hope, symbols of freedom, and images that detail the German experience after World War II. 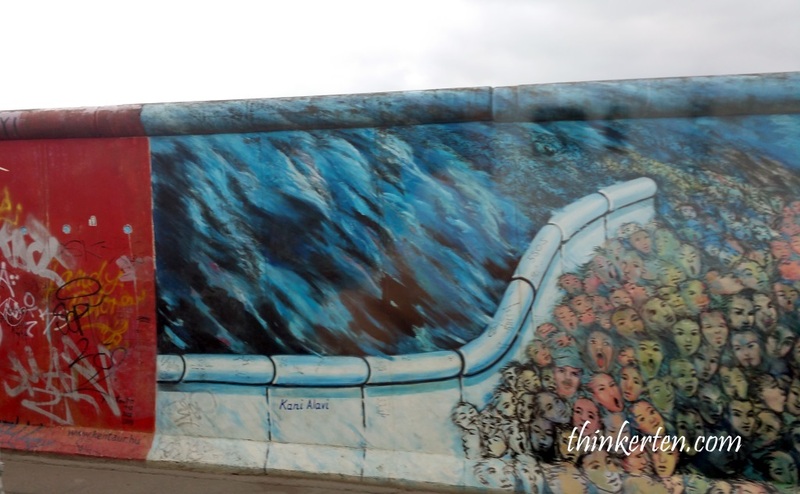 The Berlin Wall was the largest canvas in the world. Much of the artwork was not claimed by artists and remains anonymous. Because the wall was open to everyone, there were no restrictions on what artists could put on the wall. I find the above graffiti painting quite interesting, see how the people were being squeezed at the other side of the wall, what does the artist trying to tell us? One of the most famous graffiti painting of the Berlin wall is called “My God, Help Me to Survive This Deadly Love” also known as “The Kiss”. 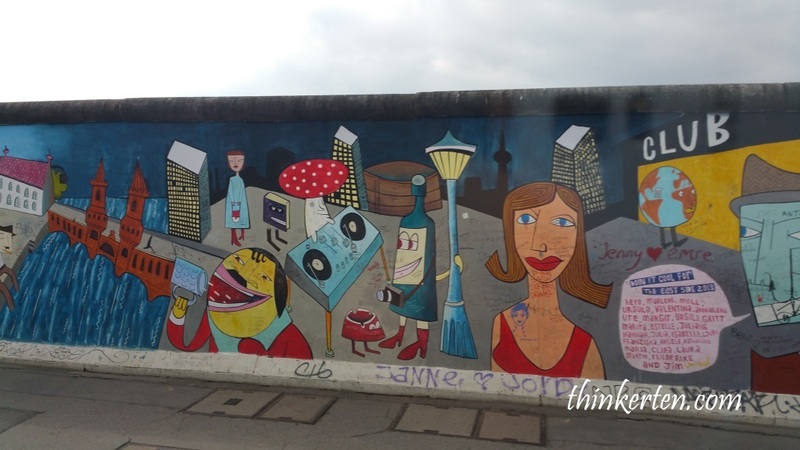 You have to find this piece of graffiti when you are in Berlin Wall. A must see! 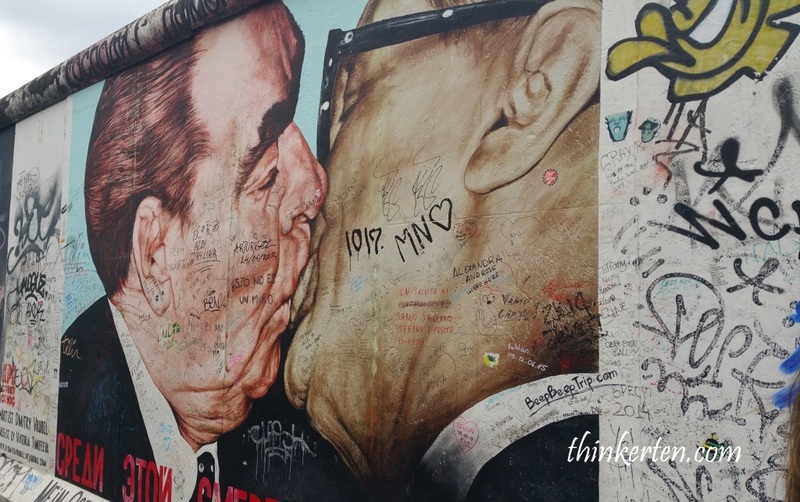 The Kiss depicts Soviet leader Leonid Brezhnev giving the East Germany President Erich Honecker what appears to be a passionate kiss on the lips. The painting is based on a real image captured by a famous photographer. We saw this O2 World which is a multipurpose indoor arena but recently known as Mercedes-Benz Arena. O2 is the telecommunication company in Germany. 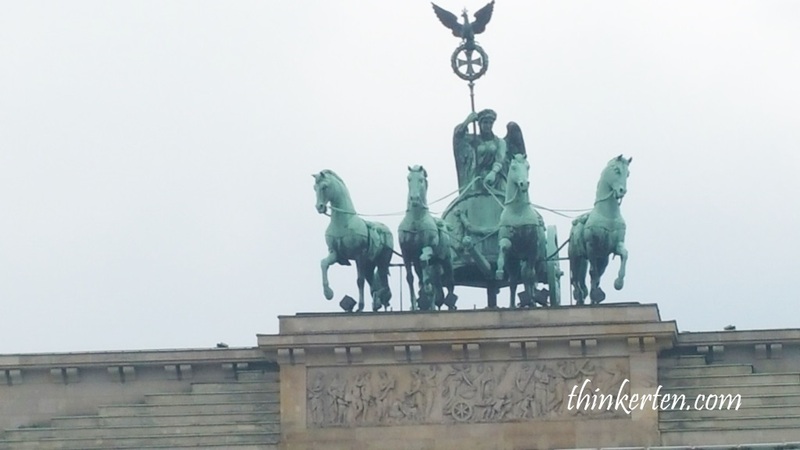 Brandenburger Gate is the best known landmarks of Germany, when we arrived early in the morning, it was already flooded with tourist. The gate has played different political roles in German history. A symbol of Berlin and German division during the Cold War, it is now a national symbol of peace and unity. Many horse carriages were there waiting to pick up tourists for ride. We saw a horse pee in the middle of the square and look quite scary! 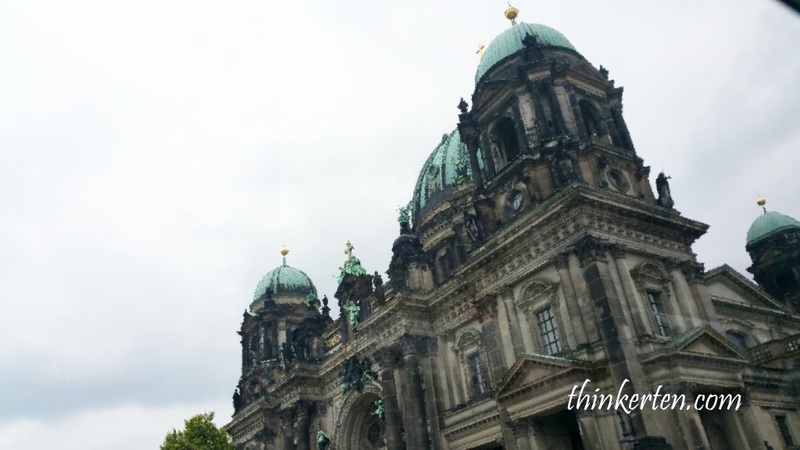 We passed by the biggest Church in Berlin city – Berlin Cathedral Church, it also serves as a vital center for the Protestant church of Germany. This is an overwhelmingly pleasant monumental church I would say. We only passed by the Pergamon Museum, we did not go in the museum. From the outside, the museum look so huge so I guess the exhibits in the Pergamon Museum can hold visitors one whole day. There were some cranes at the back of the museum, some restoration work was going on. Took few pictures outside the Parliament, still remembered it was a very windy day in summer. There is a dome on top of this building, ticket is needed to enter the dome tour. From the below picture, you can see a little bit of the Reichstag “Dome” which is made of glass. The distinctive appearance of the dome has made it a prominent landmark in Berlin as well. Saw this cute tricycle car in the middle of the busy road in Berlin city. 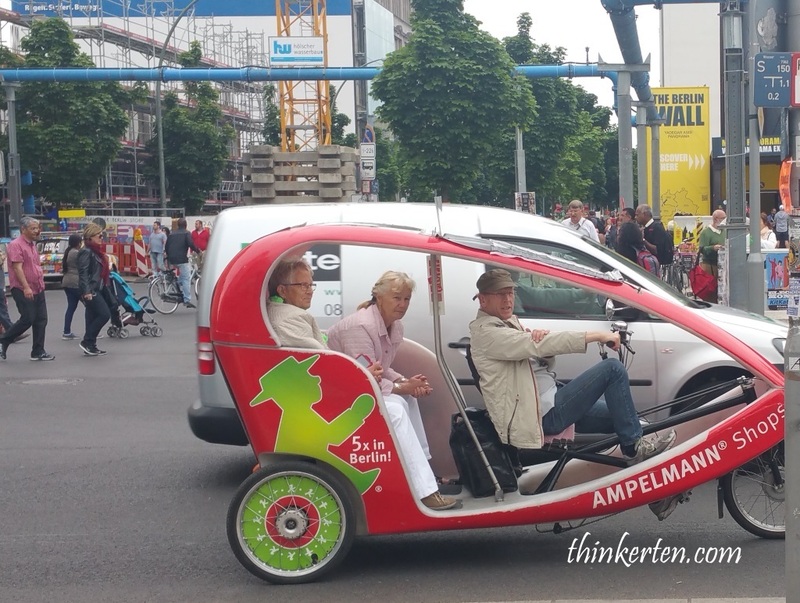 There is a sign Ampelmann shop in this little tricycle car if you look carefully. Ampelmann is literally little traffic light men, is the symbol shown on pedestrian signals in Germany. There is a green little man in the little tricycle car, that is the little green man used in the traffic light at the pedestrian crossing. I also noticed many souvenir shops selling this little cute iconic man, if you want something unusual as a souvenir, Amplemann iconic man is a great choice. 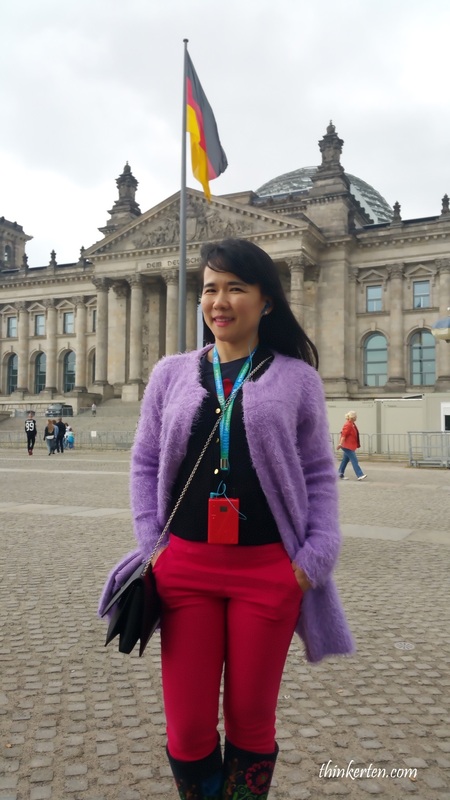 We had a local guide in the afternoon, a German lady explaining to us the history of Germany but I was really tired from the long hour flight so it was tough to adsorb the history lesson. Local guide was hired by hourly basis and it was not cheap to have her around with us just for the few hours. 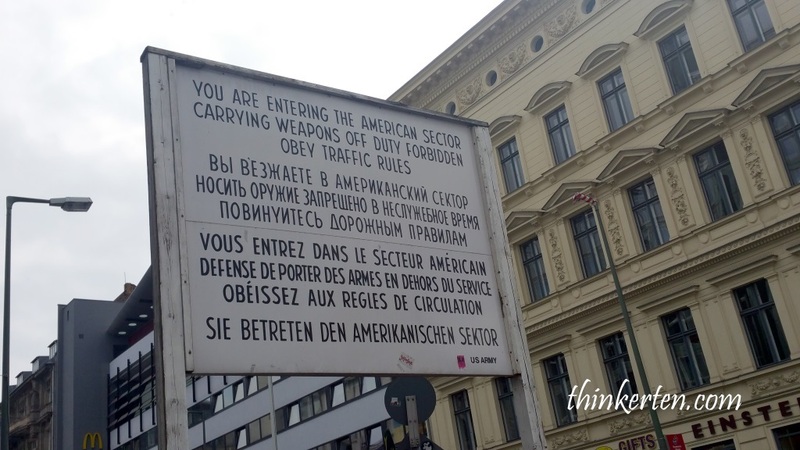 Checkpoint Charlie also known “Checkpoint C” was the name given by the Western Allies to the best-known Berlin Wall crossing point between East Berlin and West Berlin during the Cold War (1947–1991). There was also a Checkpoint Alpha known as checkpoint A and Bravo (Checkpoint B). 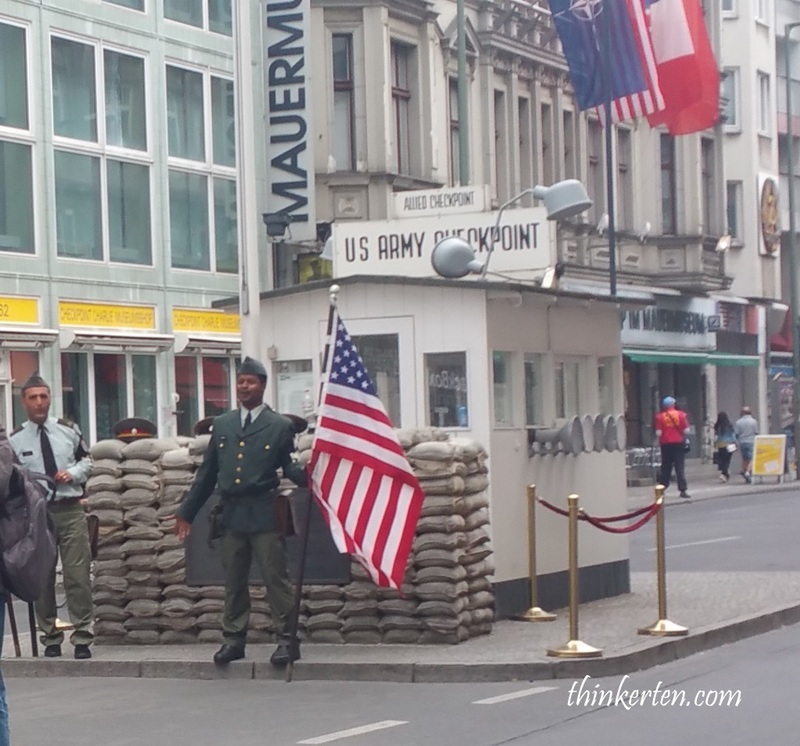 The checkpoint Charlie is historic street in the American-occupied city center. 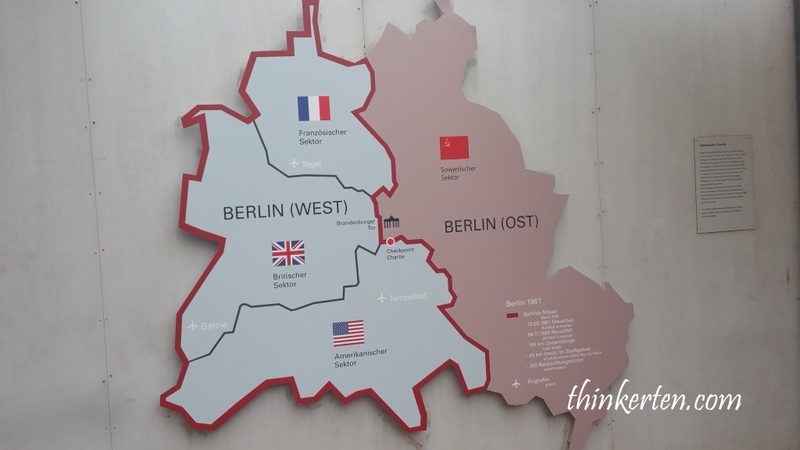 Even more important was that it was the only gateway where East Germany allowed Allied diplomats, military personnel and foreign tourists to pass into Berlin’s Soviet sector. Saw some Trabi classic cars produced in former East Germany, painted in bright colours passing by the Checkpoint Charlie. It is a great idea riding on these super cute German cars to explore around the city ! 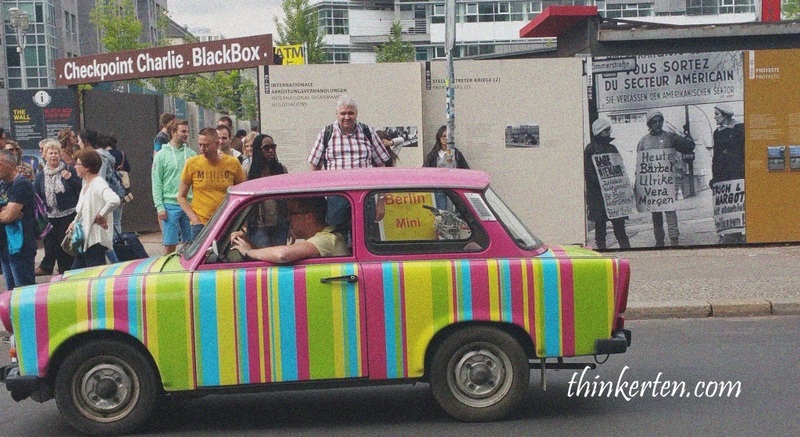 Trabi World is the company that rented out these classic cars. Sausages are a favorite German food and there were so many type of sausages in the stall which I have no idea how to order so I just simply point to a beef sausages and some fries. 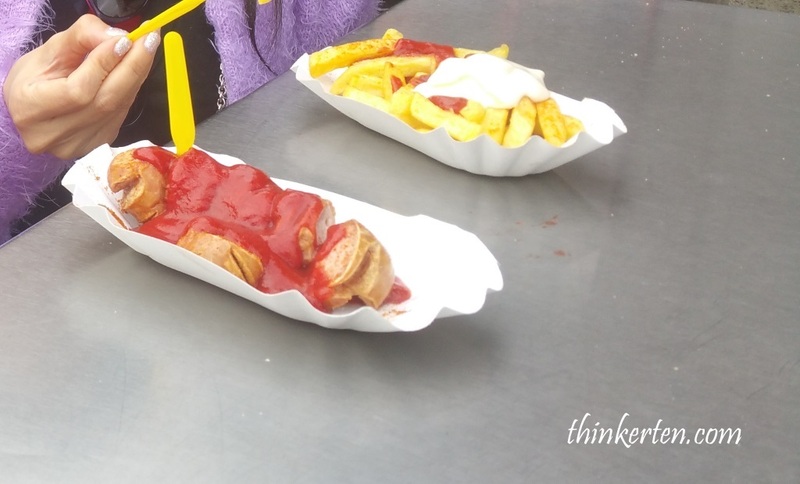 The sausages tasted awesome with ketchup and chili.